On the Italian border in the west of Switzerland lies the high alpine, beautiful village of ‘Zermatt’, known for being the village at the foot of the Matterhorn the most photographed mountain in the world, having a huge variety of summer hiking trails and sporting activities, great winter skiing with some of the steepest slopes in Europe and over 300 days of sunshine. We flew from Liverpool to Geneva taking just under 2 hours, and then took a Swiss red train taking 3.5 hours from under the airport terminal to Zermatt. This was all so laidback where you can just buy a ticket in the terminal and hop on the next train. Very well organised with frequent train departures, the journey was time-consuming but time passed so rapidly by just starring out the window taking in the spectacular scenery zooming past us. We eventually arrived in Zermatt early evening and it was warm but snowing lightly. There was an exciting vibe in the air; the cobbled streets were busy and lively still all light up by restaurants, bars and shops neon lights. There was lots of miniature, electric car taxi’s lined up outside the station waiting to take you to your hotel, it was a good job we invested in the pricy journey costing 20CHF (£14) as our apart hotel was about 10 minutes away all uphill, Didn’t really fancy dragging my suit case up that. It was dark by this time and our first time visiting Zermatt so it was a price that needed to be paid. 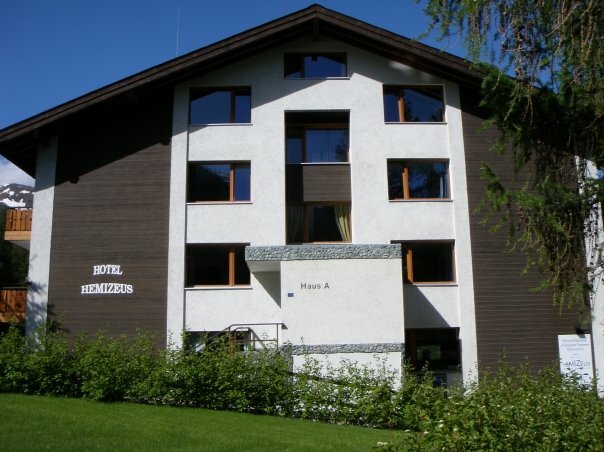 We were staying at the ‘Hemizeus Apart hotel’ for a week; it was well situated just off the main street, down a peaceful road close to a river. No one was there to greet us, but there was a lovely welcome note left for us along with our room key. The room was easy to find and we were very pleased with it. It was a studio room with a remarkable view! I have never been more satisfied with a room with a view request, it was that spectacular. The side of our room was all glass with a small balcony looking out onto the valley and a clear, undisturbed view of the Matterhorn – It really was breath taking! You could lie on your bed for hours starring out of the window and working out the route you’d climb up, watching the snow blow off the top like icing sugar. Relaxing and inspiring are two words which spring to mind when I think back of that view. We planned the relaxing summer alpine break with the intention of spending a week at altitude to get fit and do plenty of walking amongst the incredible alpine peaks to prepare ourselves for a mountain trip we had arranged for later in the year. We took a 3 day peak pass costing 169CHF (Approx. £110) to be able to use all the lifts that were open. This was so useful, to make it quicker and more accessible to get higher up in the mountains at ease. 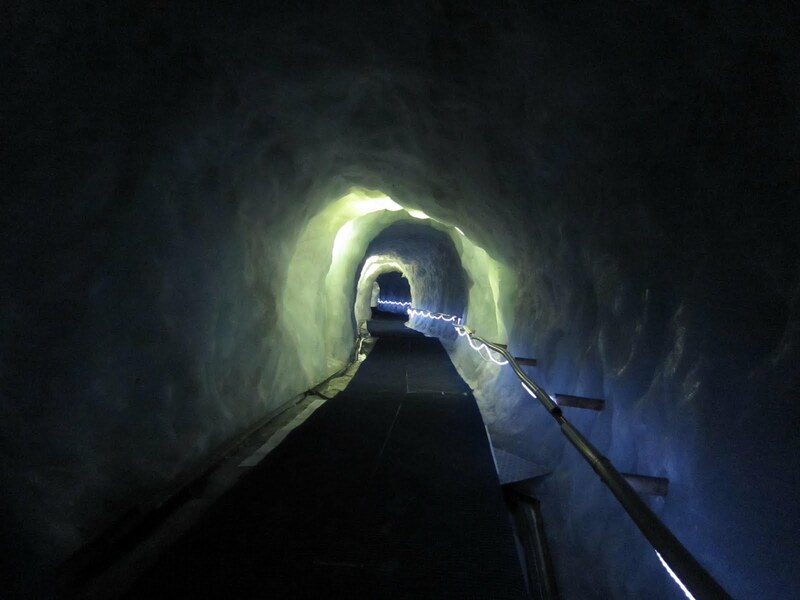 Using this pass we also visited the glacier palace, entering through a magical ice tunnel down to almost fifteen metres below the surface of the glacier. Inside is full of impressive statues sculptured from ice with magical colourful lights setting them off perfectly. 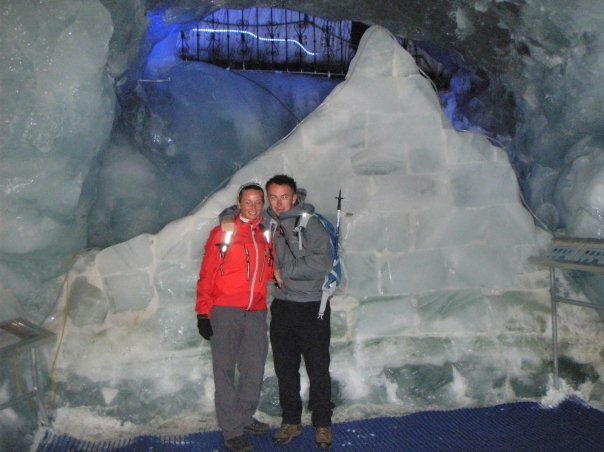 We also trekked up to the foot of the Matterhorn and walked back to Zermatt calling in mountain huts along the way. The pass also included the Gongrat cog wheel train which is the highest cog wheel railway in Europe, at 3089m. This is well worth doing just for the views from the top; it’s rated the top tourist attraction in Switzerland. The view looks out over the second-largest glacier in the Alps, the Gornergletscher, as well as 29 peaks higher than 4000 metres – and everything is almost so close that you could almost touch them or so it feels like. There is 250 miles of summer footpaths for hiking, more than enough to choose from for a week’s break. The alpine paths lead you through many environments from pine scented mountain forests, to calm alpine lakes to stunning ice blue glaciers and lookouts over all of Europe’s highest peaks. Perfect! After having a look around an outdoor shop one day and having a chat with one of the local workers there he suggested that we should try some summer, skiing. We explained we were complete beginners apart from a few lessons in Llandudno on an artificial slope and he said it would be fine! We decided to take a break from walking and try it one afternoon; it was cheap enough to add this as an option to the peak pass by just paying 28CHF extra to use the ski lift – So we did. Ski hire was reasonable being about £30 for everything for the day. 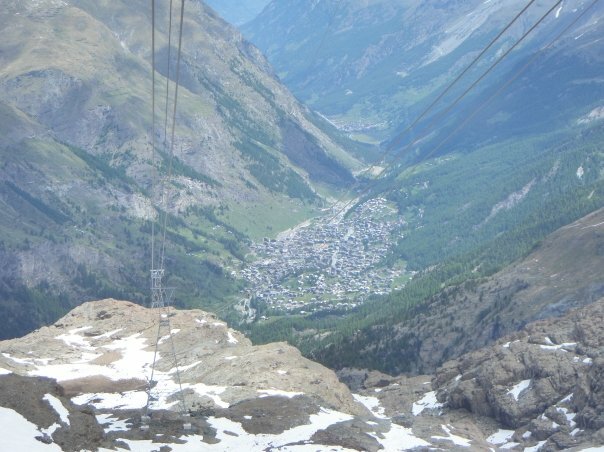 We clambered aboard the Klein Matterhorn ski lift swiftly heading up the mountain in a capsule till we reached the mountain café at the top. We then made our way outside, the sun was shining but the wind had a severe chill. Oh god I could see our next obstacle ahead of us, it was to make our way down to a chair lift. I slowly shuffled along like a penguin to line up with three other people to be transported up the steep slope with skis still on – Eeeek! I stood in line and waited 1, 2, 3 I counted before the wide chair lift came quite rapidly behind me and swooped me up, I was on – phew. What I didn’t realise was I was in charge of closing the safety bar as I was sat at the end. More importantly once we got to the top I needed to release the bar so we could get off. I was just concentrating on landing on my two feet and not falling in a heap. I had two German guys yelling at me until one of them leaned over and released the bar himself. Ha ha. It was a close call and very nearly could have been a Bridget Jones moment where we carried on going round. I scuffled out of the way and looked around me, ‘wow’ that eventful journey was so worth it, just to get to the top and take in these incredible views. 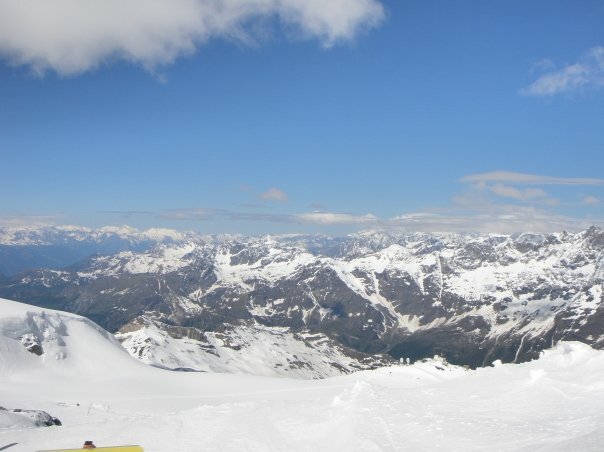 I had the graceful Matterhorn to my left, clear blue skies above me and 360 panoramic views of white majestic mountains. My only issue now was getting down! It was a lot steeper than I originally thought it would be, but children were practising there skiing on one side of the slope so I thought it can’t be that daunting. I shuffled forward getting ready to leisurely snowplough my way down. My speed soon picked up, my snow plough wasn’t working it as it should. The ground was like pure ice… The wind was blowing through my hair, the bumps from the snow was sending tremors through my whole body. I had absolutley no control! I had one option my bum! Boom I was down, skis flying in the air but I had stopped, what a relief! I was shaking like a leaf. I had a little breather before attempting a bit more. All of a sudden I heard this loud, rumble like thunder to my left I looked over and I couldn’t believe what I was witnessing it was an avalanche on the Matterhorn. My husband also saw this from lower down the slope, it was unbelievable. I got back on my feet and tried again but soon found me wildly out of control and before I knew it boom I was down again. I had had enough I was uncontrollably shaking I was that scared. So I picked my skis up onto my shoulder and trudged my way down the last bit. I had had my fill on that slope! I’m not surprised really after talking to some Canadian tourists back in the café waiting for the lift down, they informed us that it was a full on summer glacier slope equivalent to a black run! And those children practising on the side are not any children they were the Swiss downhill ski team training. 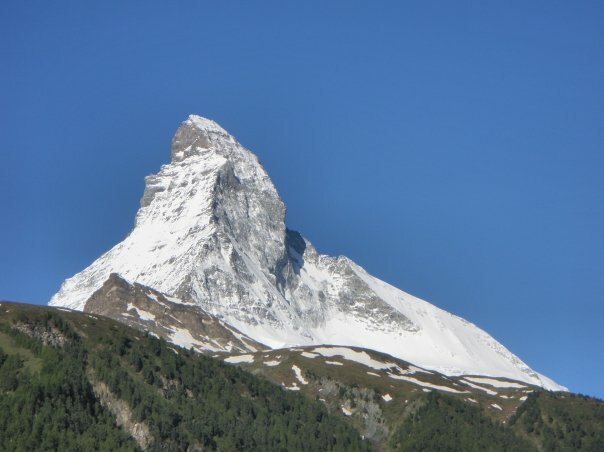 Zermatt actually has the highest summer skiing area in Europe we were told! Oh dear what was that guy in the shop thinking of… Cheers mate! So glad we attempted it though just for the spectacular views. That night we laughed so much about what the hell we were thinking whilst enjoying a well-deserved glass of wine. Eating out in Zermatt can be very expensive; prices vary immensely so definitely have a look around at menus. When up in the mountains you pass lots of unique huts offering reasonable food and drink whilst you can take a rest and absorb the striking views around you. We stopped at the end of a long day of walking for a drink and some food at a beautiful hut, but we found ourselves not knowing what language to speak French? German? English? Didn’t seem to be any of these… It was an awkward moment but somehow with lots of laugh’s and smiles we got by and enjoyed some amazing food. There is plenty of different varieties and good choices of restaurants within the village of Zermatt too. 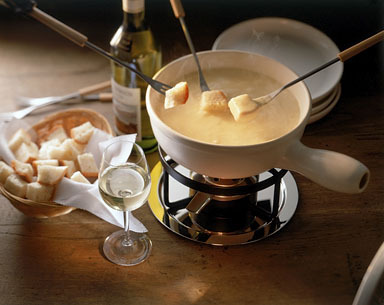 A must is to share a traditional cheese fondue – delicious! 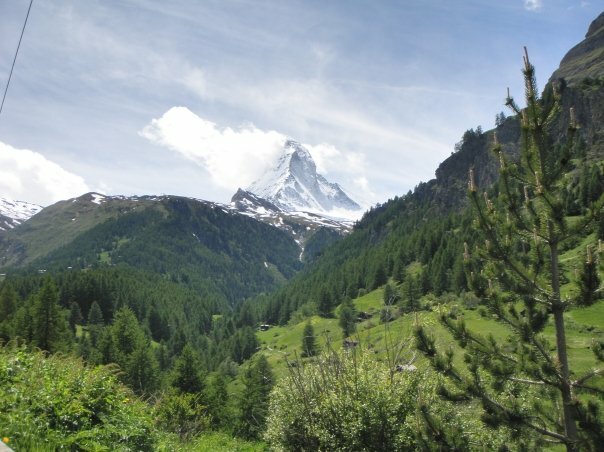 Summer in Zermatt is spectacular with so much to do; it’s mostly spoke about for its amazing winter activities. 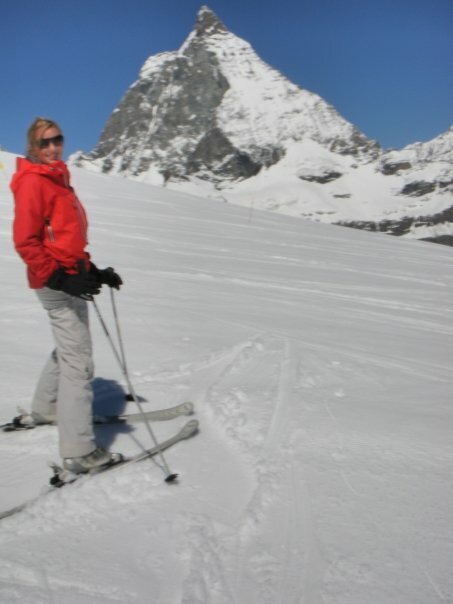 But I would highly recommend Zermatt for an active summer holiday or even a romantic, relaxing break. 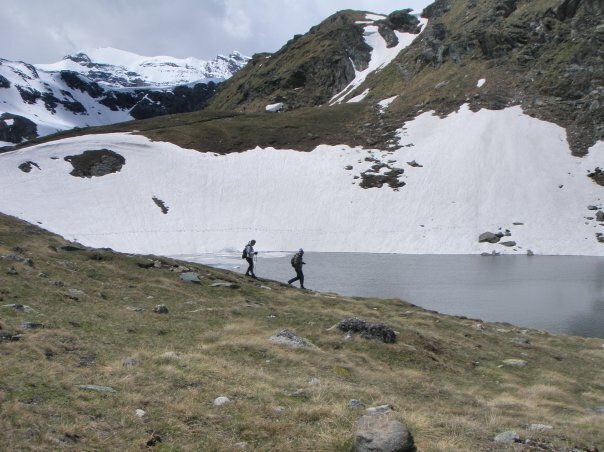 So many alpine peaks to climb and high altitude trekking paths with plenty of mountain huts thrown in just where you need them to rehydrate and add that leisurely twist to your break. We will definitely be returning to Zermatt one day!